Richard Mille and Airbus Corporate Jets - the Airbus business unit in charge of creating aircrafts for personal clients - joined together to realise an impressive timepiece which reflects the parallels between the world of aviation and that of high-end watchmaking. 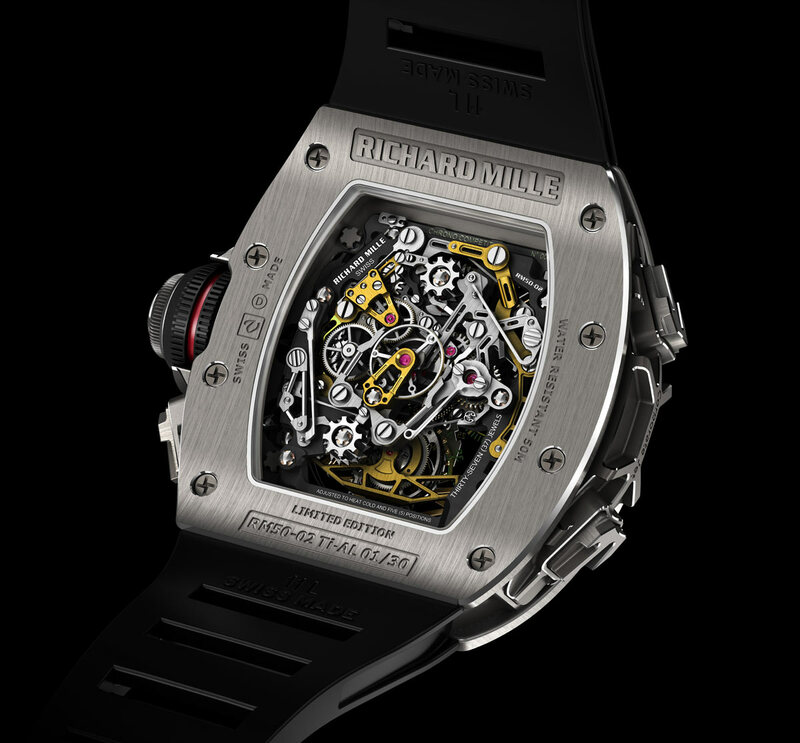 Just like the luxurious corporate jets built to match the personal desires of clients by ACJ, the new Richard Mille RM 50-02 Tourbillon Split Seconds Chronograph makes use of advanced, open worked design elements in the internal design of bridges and baseplate in grade 5 titanium, along with an extensive application of skeletonisation to every possible area, offering significant weight reduction. 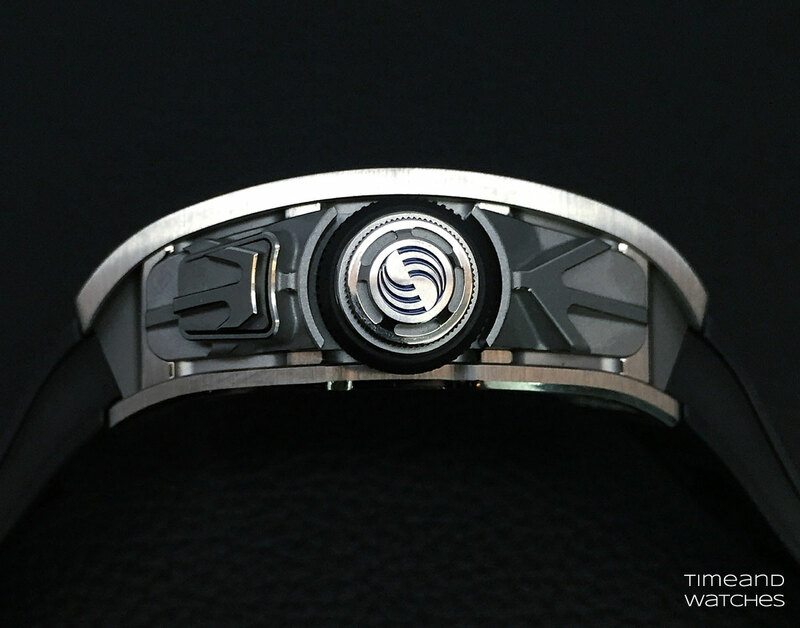 In fact, despite its pretty large size (50.10 mm x 42.70 mm x 16.50 mm), the watch is very light as well as comfortable on the wrist. A number of parts within the movement have been coated with a special aeronautical coating normally used to protect engine and chassis parts from corrosion and environmental conditions. One of the new characteristics developed for the split seconds tourbillon RM 50-02 is the virtually complete elimination of initial jumping in the chronograph seconds hand. Moreover, the development of a new generation of split seconds components meant that energy consumption of this function could be lowered by approximately 50% through the reduction of friction within the movement, and the elimination of the inertial jumping of the chronograph’s hands during stopping and starting. This was achieved by research focused on the working of the split seconds’ arms. 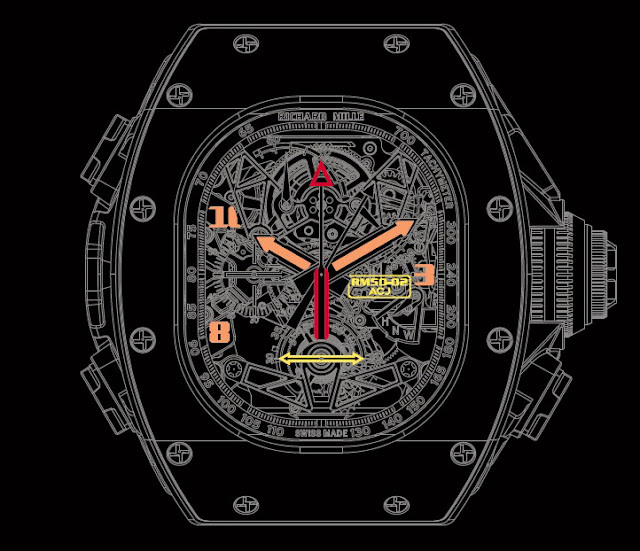 By depressing the pusher on the right at 4 o’clock, the user can stop the split seconds hand in order to read an intermediate time while the chronograph is engaged. Pressing the pusher again allows the split seconds hand to rejoin the chronograph, ready for the next measurement. 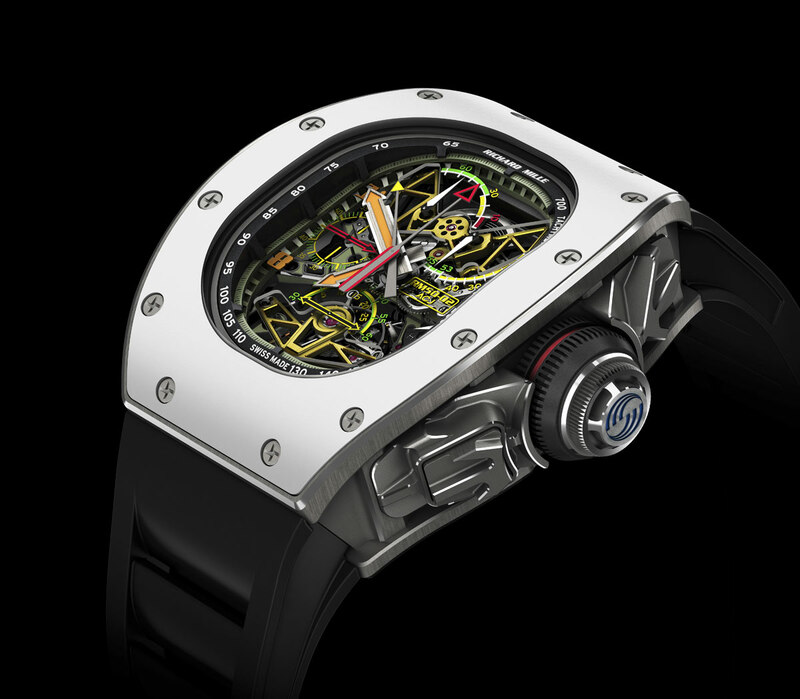 The new RM50-02 tourbillon calibre also hosts a power reserve indicator (70 hours) between 11 and 12 o’clock, a torque indicator that supplies information about the tension of the mainspring allowing the optimisation of the chronometer function and, at 4 o'clock, a function indicator to show the watch’s state in each of the positions for Winding, Neutral and Hands setting. The totally new case shape in Titanium-Aluminum alloy (TiAl) was developed to mirror the outlines of an ACJ’s typical window shape with a clearly visible, multi-layered hull structure surround. Even the Titanium-Aluminum alloy is the same that it is used in the Airbus for its jet turbine blades, which must function safely under the convergence of high temperatures and high fields of pressure, thus requiring a very strong and highly stress resistant material. The secondary bezel is crafted from ATZ white ceramic, a high quality ceramic based on aluminum oxide powder injected at a pressure of 2,000 bar with the result of increasing rigidity by 20-30% and reducing the material's porosity to an absolute minimum. After diamond, ATZ is one of the hardest materials in the world. A premiere for the brand, this is also the first time that the iconic Richard Mille screws around the outer edge of the bezel have been replaced by Torq set screws with their distinctively shaped head slots, and a jet engine inspired crown bearing an engraved, wave patterned Airbus logo. Visible through the sapphire crystal case back, the bridges of the hand-wound 3 Hz (21,600 vph) calibre RM50-02 are made of grade 5 titanium. To give more depth to the calibre, some bridges are made of stainless steel and given a golden appearance by treatment with aircraft coatings. Mind-bowling. Both the watch and the price! 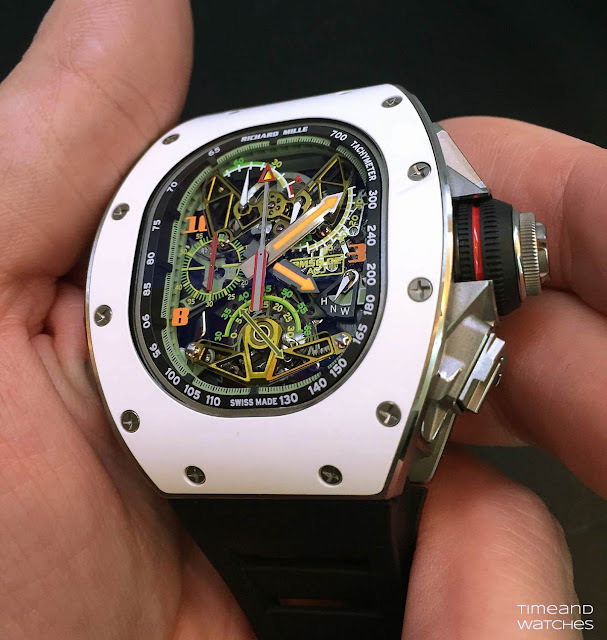 SIHH 2016: Richard Mille RM 50-02 Tourbillon Split Seconds Chronograph. 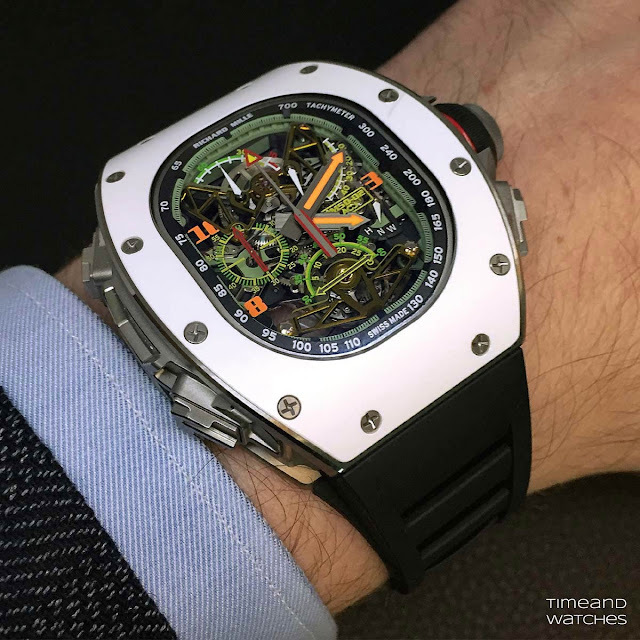 Richard Mille and Airbus Corporate Jets - the Airbus business unit in charge of creating aircraft for personal clients - joined together to realise an impressive timepiece. 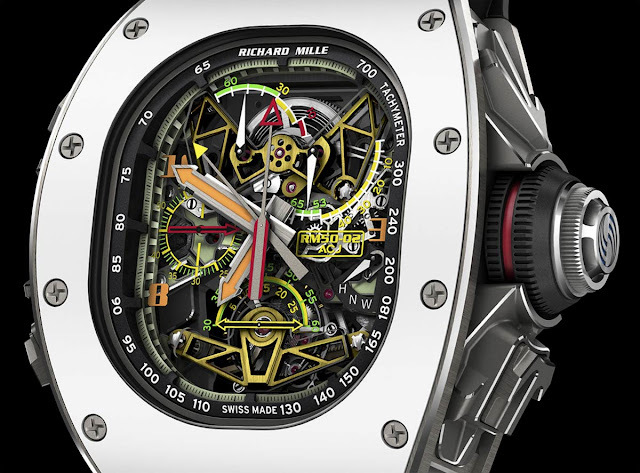 the new Richard Mille RM 50-02 Tourbillon Split Seconds Chronograph makes use of advanced, open worked design elements in the internal design of bridges and baseplate, along with an extensive application of skeletonisation to every possible area. 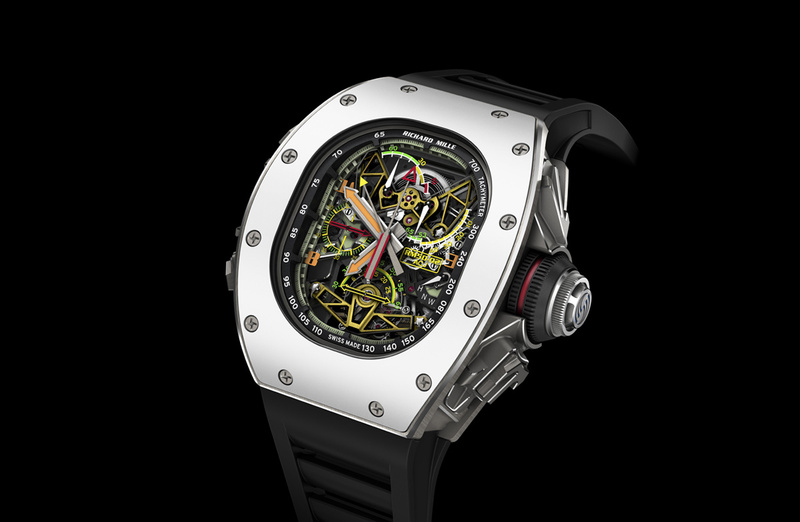 The Richard Mille RM 50-02 Tourbillon Split Seconds Chronograph is a limited edition of 30 pieces, only available in the Richard Mille boutiques. Its price is Euro 1,134,600.